Posted by Lisa Warren on Feb 11th, 2019 in Front Page | Comments Off on SGS is Celebrating 50 Years! 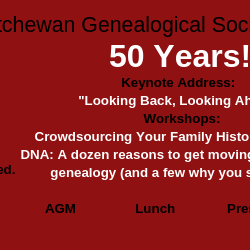 Saskatchewan Genealogical Society (SGS) is celebrating 50 years on Saturday, April 27, 2019 at Conexus Arts Centre, 200 Lakeshore Drive, Regina. Pre-registration required and cost is $65.00. See Education tab for further details.